Elephants Sanctuary Phuket Half Day Afternoon. (Phuket Elephant Sanctuary) *Located in Paklok, Thalang This is Phuket’s first safari type experience, our afternoon with the elephants program is ideal for elephant lovers and nature lovers as it offers the opportunity to observe the animals at a respectful distance while they roam through our manicured forest and bathe in our expansive pond. Your visit starts with an educational video presentation at our Tree Top Reception to prepare you for your time with the elephants and to understand the importance of protecting this beautiful animal. We then head down into the forest to find the elephants. Depending on where they are, we may explore the forest grounds or sit in one of our Observation Salas. Umbrellas, wellington boots and plastic macs are available if needed. 17.30 Return to our office in Paklok and transfer back to your hotel. We provide large golf sized umbrellas to use for sun protection as well as the rain. We find these especially useful for parents with infants and babies to protect from the sun. You wont get many chances in your life to get up close and personal with elephants, this is a really great fun day out. We are proud to present an ethical and sustainable eco-tourism project in which customers will learn how to take care of Elephants and describe the way we treat our Elephant to raise awareness and educate people from all over the world about Elephant care. Elephants Sanctuary Phuket Half Day Morning. 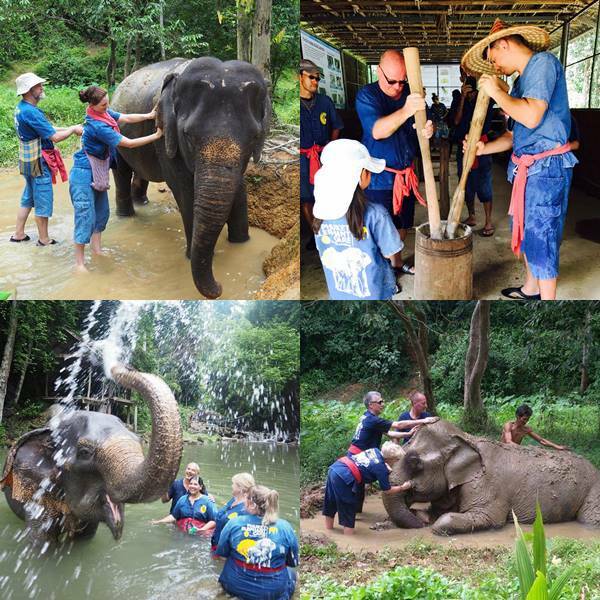 This is the place to go if you are looking to spend some time with elephants in a more natural relaxed setting, these sanctuaries are where elephants that have been rescued from work, are put to retire and relax.